Many senior citizens avoid regular exercise because they fear that working out will lead to injury or discomfort. However, studies indicate the opposite is true. 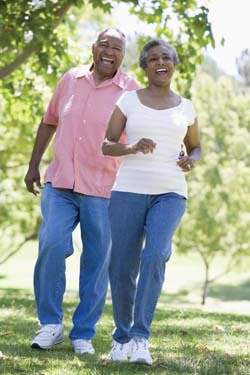 Moderate physical exercise is extremely beneficial for adults of all ages, including those 60 and older. While changes need to be made for some seniors, exercise should not be dismissed entirely because of age or ability level. Senior fitness exercises shouldn’t be intimidating or painful. Rather, older adults should embrace the chance to stay fit with a simple and enjoyable workout routine. With that being said, never start an exercise program without first consulting your doctor. You risk serious injury or other health problems if you participate in a physical activity that calls for excessive exertion. A doctor can help you create a structured workout routine that will improve your overall health without compromising your safety and well-being. As you grow older, an active lifestyle is more important than ever. Regular exercise can help boost energy, maintain your independence, and manage symptoms of illness or pain. And not only is exercise good for your body—it’s also good for your mind, mood, and memory. Many health care experts regard exercise as the fountain of youth. Staying active, especially as you age, can help you remain independent. What’s more, working out on a regular basis is easy if you put in a little effort.